Okra/Vendakka shallow fried and added to a thick mixture of yogurt-coconut gravy. Such a soothing curry or side dish that can be served with steamed rice/Biriyanis/any flavorful rice. Have it once and I'm sure your taste buds will never forget the taste of this pachadi. So here I'm sharing with all of you this yummy Okra/Vendakka Pachadi. Enjoy!!! Wash and pat dry the okra. Cut them into thin slices and set aside. Grind together coconut, cumin, green chillies, and few curry leaves. Heat up a wok/Kadai/Pan in medium heat, add oil, mustard seeds and stir for few seconds. When mustard starts to crackle add urad dal, curry leaves and whole red chillies and stir for a minute. Add the okra and salt. Stir fry till okra become golden brown. Be careful not to get them to dark brown and burn, you will have to keep stirring it till they turn there color from light green to golden color . Take it off the flame and add it to the coconut-yogurt mix. Stir well and check for the salt and taste. Add more salt if desired. Note:- As per the original recipe okra is deep fried and pachadi taste better that way may be, I was just being health cautious and shallow fried them. 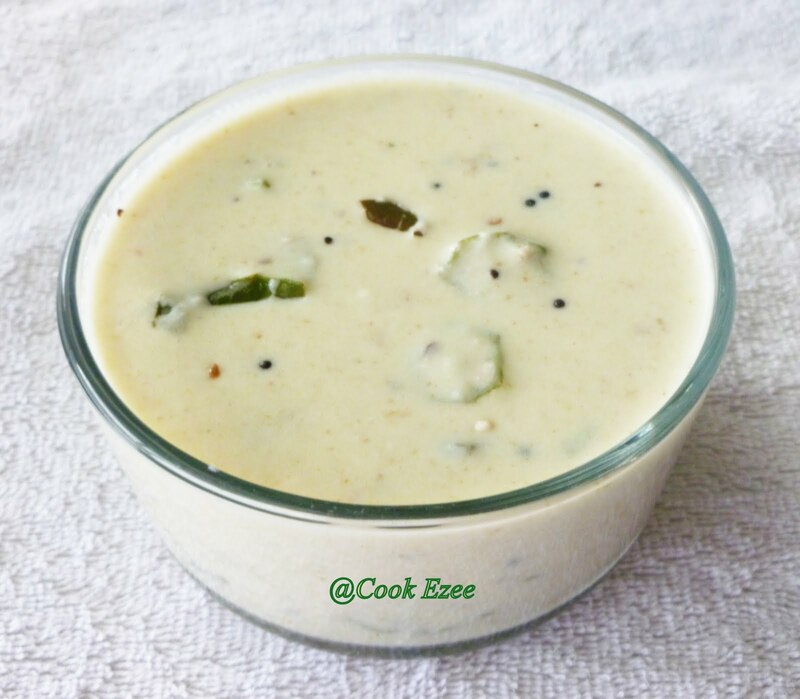 Delicious n healthy pachadi with okra.. Loved it, Pratibha!! So fresh n appetizing it looks ~ love this recipe! Pachadi looks delicious and healthy,we make it with white pumpkin. I'm hosting a giveaway at my place.